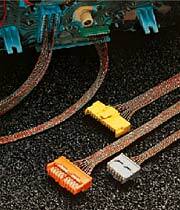 This direct-type connector was developed especially for flexible printed circuits like those used in the rear wiring of automotive combination meters. to terminal during shipping and harness assembly process. -Protection against wrenching when engaging connector. *In case of purchasing the subject parts, please contact our sales office.